Books by Rowland S. Ward as at January 2019. Religious Groups in Australia: Beliefs, History and Statistics will include introductory essays then entries on 300 or more religious groups classified by families. Presbyterians in Australia – Origins, Conflicts and Progress 1803-2018 (377pp. illustrated; pbk., 2018, repr. 2019). The author’s rather comprehensive work, The Bush Still Burns: The Presbyterian and Reformed Faith 1788-1988, published in 1989, has long been out of print. 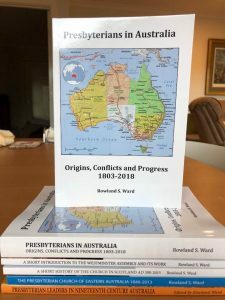 This new work simplified the structure and concentrates on the Presbyterian Church of Australia and its constituent state-based churches. It includes much new material and the earlier material has been carefully reviewed. It is essentially a theological and constitutional history, and covers the four cases (Strong, Ferguson, Angus and Cameron) where heresy was an issue. The Scots’ Church, Melbourne: A History of 175 years 1838-2013 [2014, xxi + 398pp, casebound, illustrated] Australian Scholarly Publishing ISBN 978-1925003-86-4. Launched by Professor Geoffrey Blainey, December 2014. Available from Scots’ Church, 156 Collins Street, Melbourne 3000 at $25 plus postage. 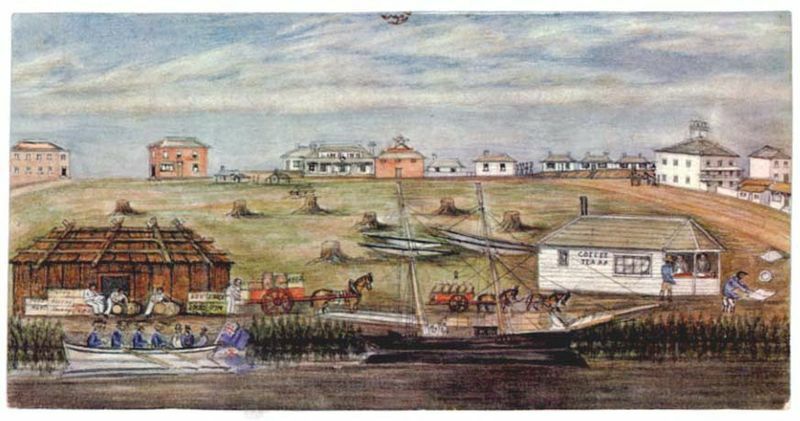 The Smith of Dunesk Mission: Forerunner of the Australian Inland Mission [2012, 48pp paper, illustrated; 2nd edition 2014] Provides the true explanation of Mrs Henrietta Smith’s interest in South Australia and how her gift was used. Describes the Mission given her name based on Beltana, South Australia 1894-1932 with detail on the Missioners including John Flynn and the author’s grandfather. ISBN 978-0-9806757-5-7 $10 Out of print but is largely incorporated in Presbyterians in Australia (see above). ‘The Directory for Public Worship’ pp. 83-175 in Richard A. Muller & Rowland S. Ward, Scripture and Worship (P & R Publishing 2007). ‘Subscription to the Confession’ pp. 77-138 in J. Ligon Duncan III (ed), The Westminster Confession into the 21st Century Vol 3 (Fearn: Mentor) 2009. ‘Systematic Theology and the Church’ pp. 289-306 in Iain D. Campbell and Malcolm Maclean (eds), The People’s Theologian: Writings in Honour of Donald Macleod (Fearn: Christian Focus) 2011.